Is it Really Always my Turn? Wars are fought in many different ways. Some have huge armies clashing on far off worlds, while others are decided in the cold void of space. But some wars are dirty, and some conflicts never happened in the eyes of crooked governments. A handful of soldiers operating behind enemy lines, fighting an invisible war that everyone will deny. Black Operations in the dead of night. 175 years in the future. This is Infinity. 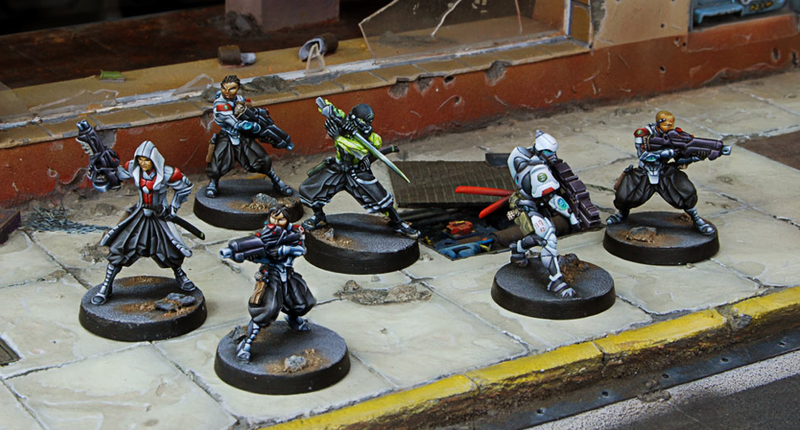 Infinity is a skirmish game, so each player usually runs between 8-15 miniatures on a 4×4 table. This in itself means it’s a cheap game to get into. As a painter it meant I could lavish each beautifully sculpted mini with a great paint job, as appose to rushing out units. 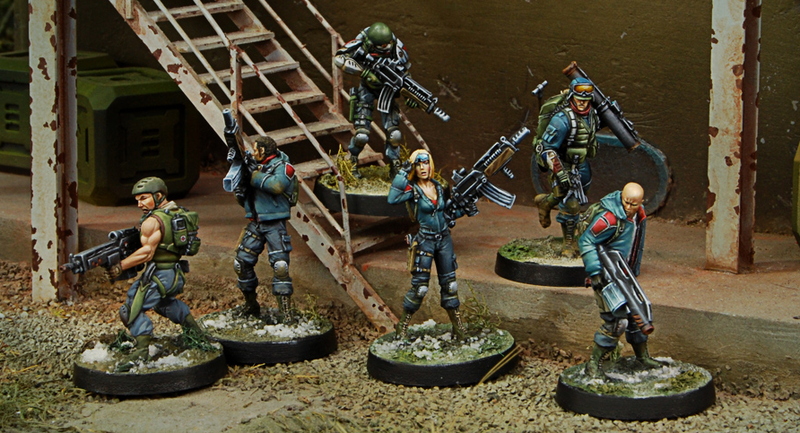 It also means you can pick up multiple factions without your wallet filing for divorce, and with each faction having a stunning range of superb sculpts, its hard to say no. So with a handful of clandestine warriors to hand you are ready to take to the table. Rules will come in handy though, and here is where it gets good. Corvus Beli has all the rules, expansions, faction stats and counters available free to download. Rules wise, everything is free. That’s crazy, well not really as it means you have more cash to spend on lovely models. It also means its easy to try it out, unlike a hefty $70 rulebook and $40 army book. A few PDFs and away you go. Remember those games where your opponent is moving mounds of models, and you drift off into unconsciousness or text your spouse about dinner? Well Infinity doesn’t have those moments. Infinity uses an I Go You Go turn structure but in effect all your models react during the other player’s turn. If the active player moves a model out into sight, your models will get to react to it by shooting, dodging, and throwing grenades. This makes it a very engaging game but at the same time means that there is no letup during a game. In other games a phase structure means all the units will move once, then all the units will fire once and then all the units will assault etc. In Infinity there are no phases – instead, at the start of the turn you get an ‘Order’ for each model in your force and get to pool these Orders together to spend how you wish. What this means is that you can control your resources and apply them where they are most needed. You might spend one order on a single model, or all the ones in your pool, it’s up to you. But your opponent can react to every order you spend if they have models within line of sight. This creates cinematic moments and a deeper layer of strategy with greater control. There are no buckets of D6 on show here. Infinity uses a handful of D20s to get the job done, which is again easy on the wallet. There are three kinds of rolls, which are often affected by situational modifiers like range and cover. • A ‘Normal’ roll where there is no opposing action by enemy models requires you to roll the appropriate stat or under on a d20. • A ‘Face to Face’ roll is where all the models involved need to roll their stat or less but they also need to beat the opposing model’s roll. Critical rolls in a face to face roll will beat the opponent’s roll even if it’s higher. • An Armor roll is made after a shot has hit, and in this case the model has to beat the damage of the weapon, applying cover and their armor value. 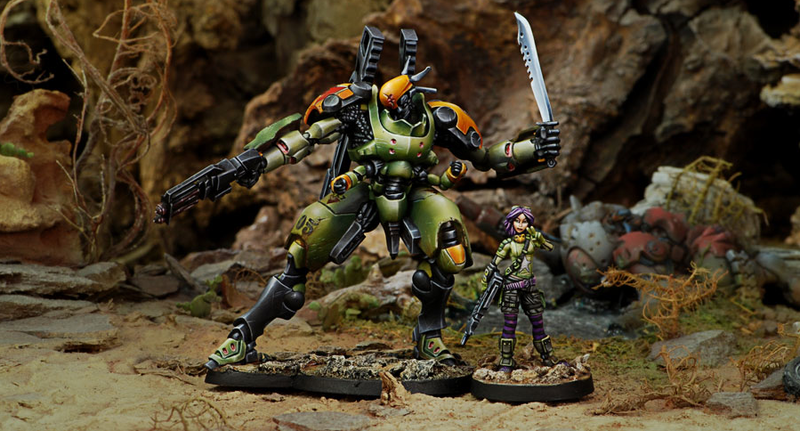 Infinity has a similar mechanic to Necromunda, in that a model is often not automatically removed when they fail their armor roll. If there is a doc on the board they go to an unconscious state, needing extra wounds to be taken off the board. Of course there are also weapons that can and will take out models in one go. Say what? Yeah, that’s right, you don’t have to tell your opponent what units you have off the table. Combined with the Order pool this again gives you tactical control, able to initiate true surprise attacks your opponent isn’t expecting. But to keep balance those units off the board do not contribute to the order pool. 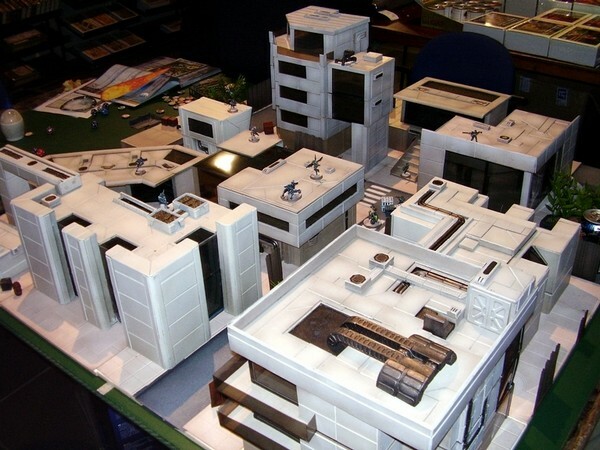 Some units also have camouflage, and are represented by counters. Remember not knowing what was under the stealer blip in space hulk? Well Infinity builds on that, meaning you can pull all kinds of tricks and play mind games. Certain units can also ‘hack’ and shut down power armor, robots among many things with an in-depth electronic warfare system. There is always multiple tactical options outside of shoot them in the face. Infinity likes terrain. In fact, it’s an essential part of the experience. 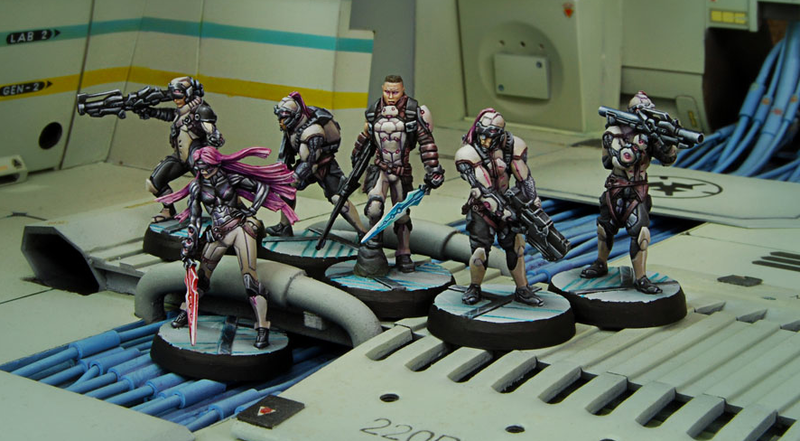 You want your space ninjas with sniper rifles hugging corners and crawling on rooftops. Gun range is considerably high, and blocking fire lanes is a necessity. What’s cool is that Corvus Beli is actively driving the main background forward. So each new book contains story developments as well as further fleshing out faction fluff. This in itself is reason to buy the books, which again are not essential. There are 8 factions to choose from, along with sub factions called Sectorials, which open and close certain unit options. Set 175 years in the future mankind has changed, with countries merging and taking to the stars. Most of the current governments and nations are long gone, replaced with new powers and corporations. Although there is little outright war in the Infinity setting there is plenty of rivalry between the various factions, leading to skirmish-scale conflicts. There are also 2 alien factions, the new Tohaa and the evil Combined Army. 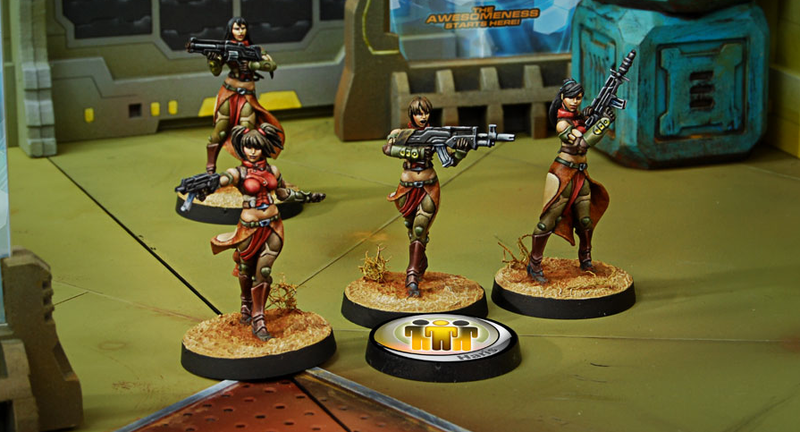 As each faction is capable of multiple playstyles they can’t be described with simple stereotypes such as ‘Yu Jing are the close combat faction and Panoceania are the shooting faction’. There is a definite sense of balance in the game and its factions. Although Infinity draws from Japanese Manga (especially Masamune Shirow’s Appleseed and Ghost in the Shell) it’s a surprisingly ‘hard’ and well-developed Sci Fi background. It has a more adult feel to it for sure, and really pulls you in. Look for more Infinity coverage coming soon.